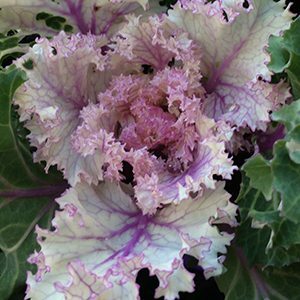 If you are looking for flowers in winter, then Ornamental Kale is one to consider. Here we are are talking about the long stemmed variety, that has been bred for colour, not for eating. You can grow it in the garden, or in containers, and it also makes an interesting cut flower. Although Ornamental or Flowering Kale is related to the culinary kale, it is grown for the colourful foliage rather than eating. It is edible, however the taste is not that great. This highly ornamental plant, has foliage that comes in many colours from white through to yellows, pinks, greens and reds. Usually grown as bedding plants, that can be mass planted, or grown as feature plants in containers. Some varieties are also grown as cut flowers. Easy to grow, you can start them from seed, or buy seedling plants at most nurseries. From seed to full sized plants will take around 12 weeks. 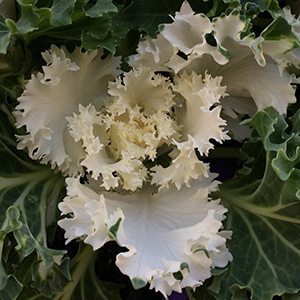 And although what look like flowers are attractive, it is actually foliage, it just colours up in the cold weather..
You can grow Ornamental Kale from seed. All you need is a cold period of the year. You will find seeds for sale of different coloured varieties. All varieties and colours are grown in the same way as ordinary kale and cabbage to which they are related. They grow well in full sun to part shade and as they are a cool season plant they are fairly easy going in this respect. One factor in growing these attractive foliage plant is climate. They do require a cool climate to colour up. In warmer climate, or if planted to late they will remain green in many cases. From seed, start the seedlings indoors in early winter, seedls will germinate in around 2 weeks and can be potted up as soon a one or two good sets of leaves form. It is a good idea to pot them up early, rather than let them become root bound in seedling trays. They do need a humus rich fertile soil to thrive, so prepare the garden bed before planting out. In containers use a good quality potting mix. Once planted out they do need to kept moist, however they do not like wet soils, so allow the soil to dry just a little between waterings. Fertilise regularly with a liquid seaweed fertiliser. So the Ornamental Kale seeds into a seed raising mix, or good quality potting mix in pots or trays. Let them grow in the seedling trays for about 6 weeks. Keep moist and in good light. After 6 weeks they are ready to transplant. Choose a humus rich well composted soil or good quality potting mix. Transplant into the garden with seedlings around 80 cm apart. 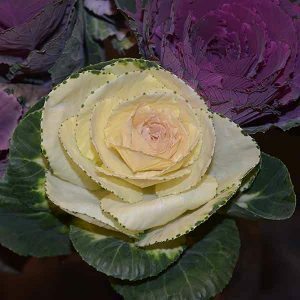 In containers, plant Ornamental Kale closer together ( 30 cm) for a mass display. Use a liquid seaweed fertiliser and something like Seamungus, for great results. As a cut flower the tall stalks and colourful flowers make this a standout in winter. Strip the lower foliage away to reveal long stems. You will need change the water in the vase every day, and strip the bottom of the stems every 3rd day to prevent the water from smelling. This is a small price to pay for such dramatic flowers.